Andrew Blackwell is a travel writer who does not have a taste for places mentioned in Lonely Planet. His wanderlust takes him to places, which might revolt many. Chernobyl for instance. In Visit Sunny Chernobyl and Other Adventures in the World’s Most Polluted Places, he advises travellers to put “their health concerns on hold. A few gamma rays, for instance, are a small price to pay for a day hike through Chernobyl’s exclusion zone, the quarantined part of the city.” But Blackwell does not turn horror into exotica. He is instead drawn to the curious numbness of the ghost city. 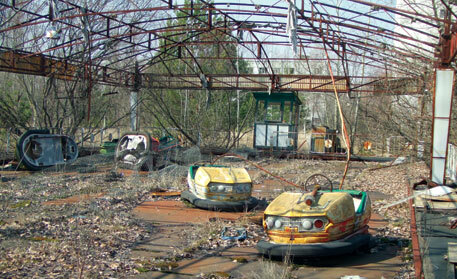 Chernobyl’s exclusion zone was once a city of 50,000, and Blackwell finds how time stands still there. At a kindergarten, which was abandoned at a minute’s notice, he finds toys strewn about on the floor. An eye for detail and diligent evenhandedness are Blackwell’s chief virtues. At the controversial Alberta tar sand pits, for example, he is skeptical of both those who suggest that Canadian crude will greatly mitigate the US’ dependence on oil from West Asia and activists who declare the project an unmitigated environmental catastrophe. In Port Arthur, Texas, where the Keystone XL Pipeline would have deposited Albertan oil for refining, he listens sympathetically as residents narrate stories of cancer they believe is caused by refinery incinerators, while conceding that “it is excruciatingly difficult to make definitive statements” about the long-term health effects of the city’s oil industry on local inhabitants. Blackwell also visits places where people have managed to turn the table on pollution. One such place is the Gowanus Canal in New York City, once one of the most polluted spots on the US East Coast. About 10 years ago, people around the area took their canoes into the canal and set up a conservancy fund for it. Today canoes are a regular fixture at the water body, and one of the ardent rowers is Blackwell himself. But other than Chernobyl and Garbage Island, to an extent, Blackwell is unable to make a case for pollution tourism. He does avoid the sentimentality that often colours environmental writing, but then he is preachy in his own way. For example, when investigating the soy industry’s actions in the Brazilian rain forest, he argues that it is not just multinational corporations that rely on rainforests for profit but local farmers and land owners as well. A point well made, if one is trying to counter environmentalism but Blackwell’s encomiums for the soy industry are unlikely to draw the tourists to denuded tracts of the Amazon forests.